2/7/2011- Roswell Invaders Uniforms are out of this world. When the Roswell Invaders team was announced in August 2010 the team colors were originally Black and Royal Blue a very modern traditional baseball look. The local Roswell Community quickly informed the leaders of the Invaders there needed to be a change. The unofficial/official colors of Roswell were lime green and navy due to Roswell being the UFO Capital of the world. So with the exception of the Seattle Sounders MLS Team and the Sacramento Surge of the World League of American Football the Invaders will be the only team to take the field wearing lime green. 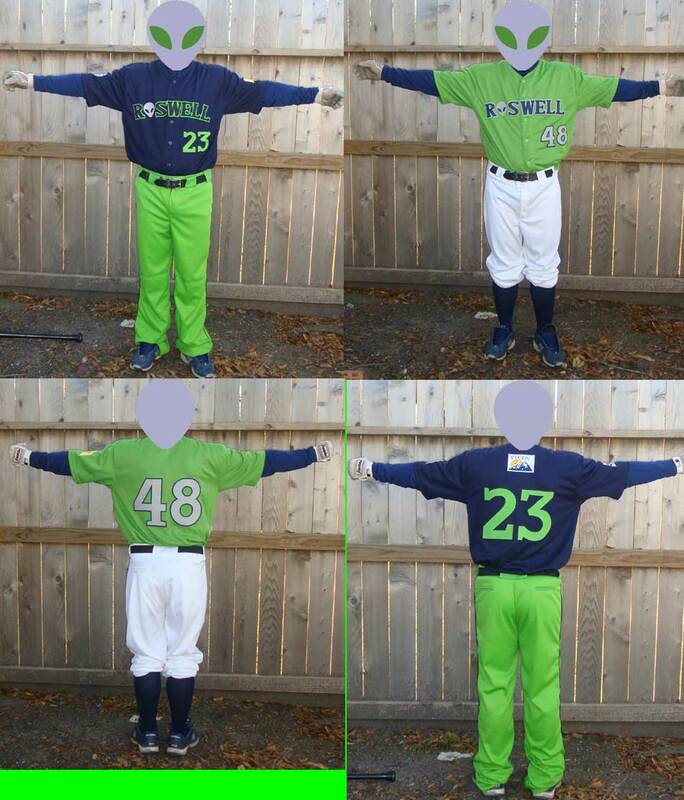 The Roswell Invaders will don Navy Jerseys with Lime Green Pants and Pin Stripe Pants Grey with Navy Pins. The Invaders will also don Lime Green Jerseys with White Pants. And possibly once during the season the Invaders will go Lime on Lime...The Invaders will wear Navy Hats.